As digital devices get smaller and faster, once ubiquitous 5 V logic has given way to ever lower-voltage standards like 3.3 V, 2.5 V, and even 1.8 V, leading to an ecosystem of components that need a little help talking to each other. For example, a 5 V part might fail to read a 3.3 V signal as high, and a 3.3 V part might be damaged by a 5 V signal. 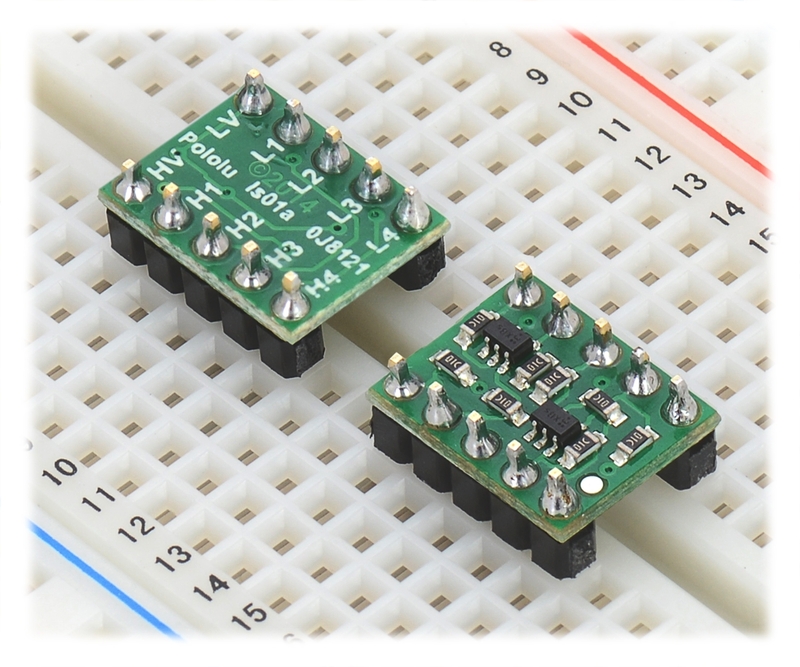 This level shifter solves these problems by offering bidirectional voltage translation of up to four independent signals, converting between logic levels as low as 1.5 V on the lower-voltage side and as high as 18 V on the higher-voltage side, and its compact size and breadboard-compatible pin spacing make it easy to integrate into projects. The logic high levels on each side of the shifter are achieved by 10 kΩ pull-up resistors to their respective supplies; these provide quick enough rise times to allow decent conversion of fast mode (400 kHz) I²C signals or other similarly fast digital interfaces (e.g. SPI or asynchronous TTL serial). External pull-ups can be added to speed up the rise time further at the expense of higher current draw. See the schematic diagram below for more information. 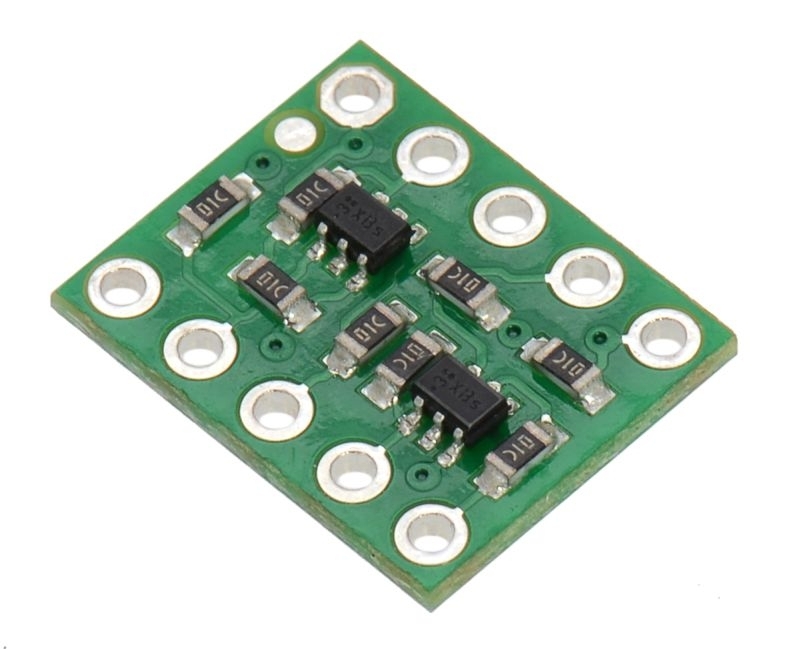 This logic level converter requires two supply voltages: the lower-voltage logic supply (1.5 V to 7 V) connects to the LV pin and the higher-voltage supply (LV to 18 V) connects to the HV pin. The HV supply must be higher than the LV supply for proper operation. Logic low voltages will pass directly from Hx to the corresponding Lx (and vice versa), while logic high voltages will be converted between the HV level to the LV level as the signal passes from Hx to Lx or Lx to Hx. The level shifter circuit does not require a ground connection to either device, so there are no ground pins on the board. 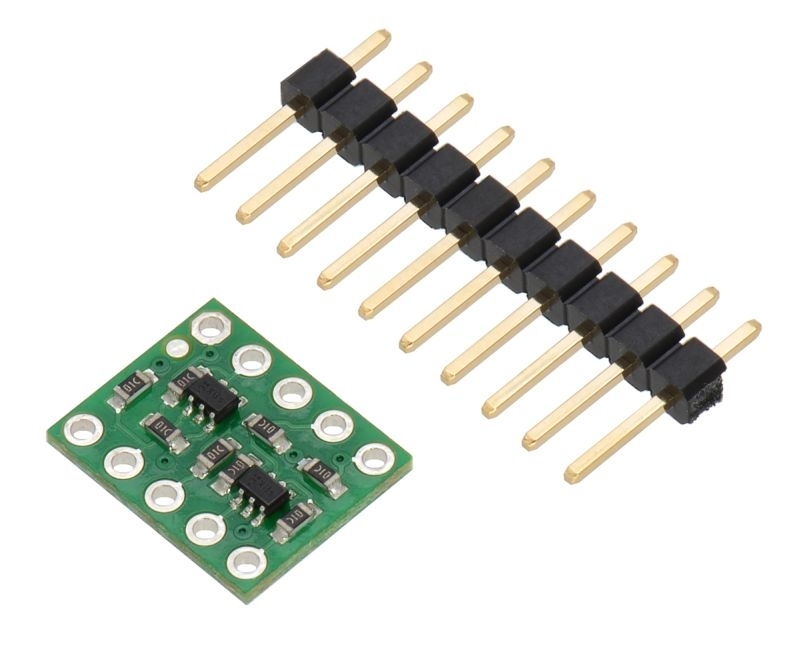 (Some competing level shifter modules provide ground connections that simply act as a pass-through; we have opted to leave these off and make the board smaller.) The two devices being connected through the level shifter must still share a common ground.